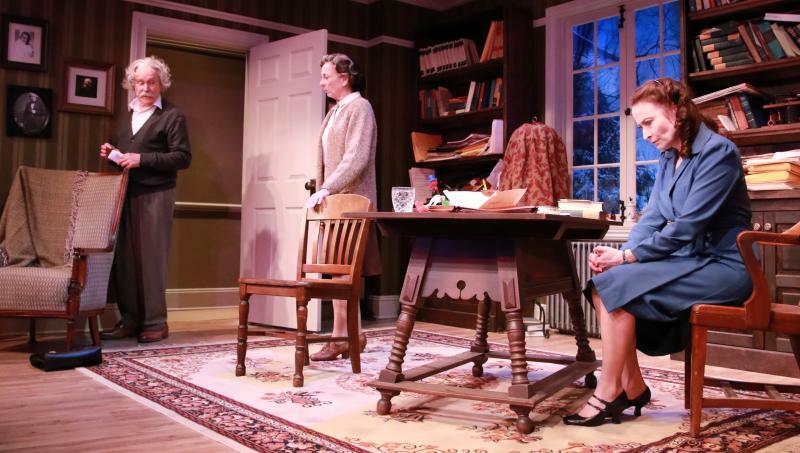 STONY POINT – The New York premiere of “Relativity,” written by Mark St. Germain, opened the 2018 season at Penguin Rep Theatre this past weekend. The play, directed by Penguin’s artistic director Joe Brancato, and produced by Andrew M. Horn, presents a look into the personality and private life of the most famous scientist of the 20th century, Albert Einstein. Most everyone knows of Einstein’s career as a scientist, his accomplishments and his advancements in the world of physics – but how much do you know about Einstein the family man? Set mainly in the home of Einstein, “Relativity” features a series of interviews between the scientist, played by Robert Zukerman, and a persistent journalist, Margaret Harding, played by Celeste Ciulla. Recently hired by the local paper, Harding has her mind set on getting an interview with Einstein, repeatedly visiting his home in Princeton, New Jersey only to be turned away time and again by Miss Dukas, Einstein’s personal caretaker played by Susan Pellegrino. Finally, having followed the professor around, she is able to convince him to speak to her, but she will later find out perhaps he doesn’t have the answers she is looking for. “Relativity” shines a light on a different part of Einstein’s life than you would see in history textbooks and media coverage, including darker chapters that call into question his moral fiber. The idea that nobody is perfect, especially those we idolize, is a large part of the play’s message. St. Germain has made dramatic examination of the personal lives of influential historical figures a focus of his writing career, previously authoring plays about Sigmund Freud, Henry Ford and Thomas Edison [on a camping trip together] and sexologist Dr. Ruth. The short, three man show is full of emotion and surprises, leaving the audience feeling a sense of familiarity as they gaze into these lives. The production has gorgeous scenic design by Brian Prather, costume design by Patricia E. Doherty, lighting design by Martin Vreeland and sound design by William Neal. “Relativity” will run through June 10. Performance days and times are as follows: Thursday evenings at 7:30 p.m.; Friday and Saturday nights at 8 p.m.; Saturday matinees at 4 p.m. and Sunday matinees at 2 p.m.
Penguin’s intimate, 108-seat theatre, which is located at 7 Cricketown Road, is converted from a 1880s hay barn, and offers air-conditioning and heating, wheelchair accessible entrance, and plenty of free parking. For tickets and more information, visit www.penguinrep.org.